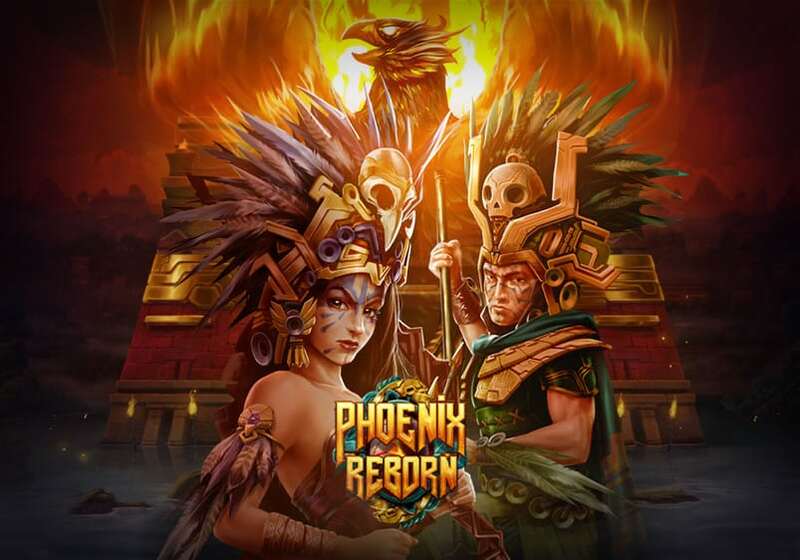 Phoenix Reborn is a 5 reel, 40 payline title from Play ‘N Go that has an Aztec theme. It benefits from a Phoenix wild symbol that expands to give you a wild reel – this also applies in the Free Games feature where up to 40 free spins can be won. In the feature, you’re guaranteed 1 wild reel on each free spin with the possibility for more – it’s high variance as you’d expect. Phoenix Reborn is a Play ‘N Go slot with 5 reels and 40 paylines. Playable from 20p to £100 per spin, you head to the ancient Aztecs and join them to reveal the treasure of the Phoenix. It comes with an expanding Phoenix wild and a Free Spins feature where up to 40 free spins can be won with a fixed wild reel and the possibility to get wild reels on the other 4 reels. The game has an Aztec theme and is set against a temple backdrop – played with 5 reels and 6 rows, symbols on the reels include 5 Aztec style symbols as well as toucans, snakes and panthers. You’ll also see male and female Aztec warriors which appear stacked on the reels – the female warrior is the most valuable symbol giving you 10 times your stake for 5 across a payline. The Phoenix is the wild symbol and substitutes for any symbol bar the scatter – when it lands on a reel, it will expand to fill that reel to give you a wild reel. If you get more than 1 on a spin, prepare for big wins – 5 across a payline will reward you with 25 times your total stake. The other symbol to look out for is the mystical Aztec Mask as this is the scatter – if you get 3, 4 or 5 on a base game spin, you will trigger the Free Spins feature with 7, 12 or 20 free spins respectively. During the feature, 2 or more Aztec Mask scatters will give you additional free spins – 2, 3, 4 or 5 scatters will give you 3, 7, 12 or 20 extra free spins which will result in a total of 40 free spins potentially. Furthermore, an expanded Phoenix wild symbol will randomly cover 1 reel on each free spin – i.e. a guaranteed wild reel for each free spin. Phoenix wilds can appear on the other 4 reels meaning you could benefit from 5 Phoenix wild reels on each free spin! As you’d expect from Play ‘N Go, Phoenix Reborn is a highly volatile title – you can win a maximum of 5,000 times your stake in total overall. Per spin or free spin, the most you can win is 1,000 times your stake – that happens if you fill the reels with Phoenix wilds. If you like the Aztec theme, Aztec Idols by Play ‘N Go is worth playing and often overlooked – it’s also high variance and offers payouts of up to 5,000 times your stake on each spin/free spin.